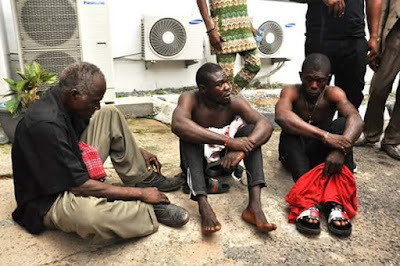 The Edo State government has handed over 70 years old Mr Francis Ezomo and his two sons – Nosa and Festus Ezomo – to the Edo State Commissioner of Police, Johnson Kokumo, for allegedly defiling a nine-year-old girl, who is a relative of his wife. Mr. Francis was arrested alongside his sons, Nosa Ezomo 26 years old and Festus Ezomo aged 29 for defiling the little girl, who is their mother’s relative. The Acting Chairman of the Edo State Universal Basic Education Board (SUBEB) and Special Adviser to the Edo State Governor on Basic Education, Dr Joan Osa Oviawe, told journalists after the suspects were handed over to the Police at Government House, Benin City, that the victim’s headmistress reported the case to her office. “The issue came to the limelight when the headmistress of the minor's school noticed a change of behaviour in the child and decided to ask her what the problem was. The victim narrated her ordeal to the headmistress who then informed the Education Secretary of the local government council where the alleged crime took place. We swung into action and got the Ministry of Women Affairs and Social Development involved,” Oviawe said. The SUBEB boss added that when they could not get the necessary action required from the Police, the state government swung into action and these three men were apprehended almost immediately. She expressed further that the Ministry of Women Affairs and Social Development had taken custody of the child who is now in a safe place. Adding, she assured that SUBEB would ensure that her education was not truncated. "What the men have done is bad and their actions have attempted to destroy the life and future of the minor. The three men took advantage of the child and exposed her to trauma. We have waded into the case to ensure justice prevails,” Oviawe decried. Reacting to this, the CP assured the state that his men would investigate the allegation and charge the case to court. “Scientific investigation for the minor was sent to the hospital and a doctor report has shown that her hymen has been broken. The scientific report has established that the minor was sexually abused. We will investigate the case and charge them to court”, Kokumo said.